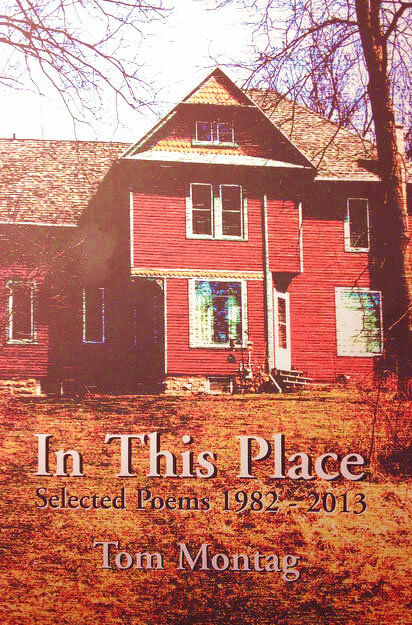 In This Place: Selected Poems 1982-2013 by Tom Montag. MWPH Books, 2014. Reading Tom Montag’s poetry is a lesson in finding stillness within movement. The poems are crafted with striking haiku-like spareness, each poem situated in the natural world and its rhythms. Yet Montag does not hold to the strictness of the form of haiku, instead letting each moment and each question rise from and occupy place itself. With the exception of the earliest sections and “Chicago, Be Gone!”, an ecopoetic response to Sandburg, part of this spareness can be attributed to the minimal intrusion of the human figure or imposition of the manmade. In a literary moment when so much poetry is narcissistically self-aware, it can be easy to feel untethered in Montag’s poems. This is by design, particularly if we listen to Montag himself, who in the introduction to this collection says his poems are intentional in the sense that they see in moments. “To see is to pay attention to the moment, what it is… This moment, this here and now, this frog jumping (Montag, xiv).” Montag aims to liberate the moment and manages to do so without a cumbersome self-preoccupation. Yet it would be wrong to imply there is not a human presence in these poems. That presence is mind itself in the more expansive Zen sense of “Who is thinking?” The resulting voice is deceptively plain, melancholy and modulated within the expansive landscapes it explores. “You will see that I prefer plain words, small and earthy words that do not stray far from the things we can see and touch and taste (Montag, xvi).” Montag takes us through Wisconsin and the Great Plains geographically and elementally. The wind and rock become a recurring characters, with the wind being a constant companion, eliciting the poems, many times feeling as though it is driving them and providing a foil for the mind which returns to and grounds in the present moment again and again. In “Crossing Nebraska” the horizon can be viewed as a metaphor for the restless mind as well as the restlessness of human endeavor. Given the Zen influence and situation of this poetry in the natural world, it might be tempting to try to draw comparisons between Montag’s poetry and that of Gary Snyder. There may well be an influence, especially when Montag writes of the Great Plains and the relentless wind moving across vast tracts of open land, though less and less the case in the continual crowding of human development. But Montag lacks the existential crackle and heart’s leap of Snyder, favoring instead a quieter, restrained and sometimes dark, tone. It does no good to pray. hold your cup and wait. Though divided into more than a dozen sections, this anthology can be read as one long meditation. It may be summed up best by the title to the opening sequence Between Zen and Midwestern. In waiting for grace, this place, this land, this anthology, is a cup. Kathleen Eull holds a BA in English from the University of Wisconsin-Milwaukee. Her work has appeared in The Emergency Almanac, Echoes, KNOCK, pith and as part of the Verse and Vision II project at the Q Artists Cooperative in Stevens Point, Wisconsin. In addition, an interview with New York-based poet Scott Zieher appears in his second book IMPATIENCE (Emergency Press, 2009). Her work as an editor includes serving as an advisory editor for Emergency Press, a guest editor of Echoes, and as an editor for the University of Limerick Ralahine Centre for Utopian Studies. She has been a book review contributor to Verse Wisconsin and served for three years as the co-chair and event coordinator for the Southeast Wisconsin Festival of Books. Ms. Eull is the founder of Pyxis Creative Solutions LLC, which provides editing, writing and promotional services, particularly in academic, literary, and nonprofit settings.